What's more apt for illustrating business issues, in this case particularly the rapid evolution of industrial marketing approaches? Everyone will have a preference - and both are overused for sure. Nevertheless I'm going to flog the military analogy one more time here - it's the one I know better. 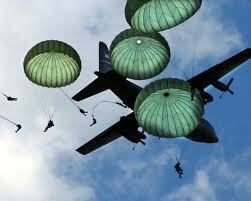 In military parlance an "airborne operation" is the process by which a large number of troops are directly and rapidly inserted into a location by parachute. Often this is used to seize airfields by which additional follow-on troops can be moved in using conventional air movement - plane lands, unloads and leaves for the next group. For purposes of surprise and effectiveness these operations are normally conducted during dark. They are carefully planned (meticulously) and rehearsed. Leaders are expert at identifying potential risks and complications and planning for them in advance. Nevertheless there are a myriad of potential complications which can and do arise, and planning intentionally accounts for those as well. One of the first elements of an "Operations Order" is the section known as "Commander's Intent." At each organization level, each trooper understands not only their specific assigned tasks, but also the overarching objectives of the leaders several levels above. Armed with this "context" they can respond with individual initiative as evolving conditions require. And conditions will evolve. As the old saying goes, "No plan survives the first contact with the enemy." And in the case of an airborne operation - imagine 50 planes each carrying 150 soldiers, flying in the dark without communications and filling the air with these men, their parachutes and their equipment. The opportunities for mistakes and mishaps is enormous. What's this have to do with B2B Marketing? Think about it - industrial marketing these days is about constantly adjusting, adapting, responding and preempting. Planning is critical, but plans are often obsolete as they are published. The solution is clear: strategy and tactics - and identifying the highest caliber people and resources upon which one can rely as the stress level ratchets up as it inexorably does. A CMO can't review every tweet, for instance - but Twitter must be used. And associates responsible for responding to engaging on twitter on behalf of companies and brands must clearly understand the context and priorities within which they do so - and when they can appropriately respond or when they must involve a supervisor. It's a rapidly moving environment and the opportunities for errors are seemingly endless. The consequences for both missteps and inaction are swift and often severe. If you accept the fact that you must engage using evolutionary marketing methods for industrial marketing, then the choice isn't whether, but how to build your systems to maximize opportunity, respond swiftly and maintain a cohesive and effective approach. Fortunately your job is easier than the commander who orders thousands of troopers out the door of a plane 500' in the air in the darkness. Easier - but not simple. The pace and volume require delegation. And delegation requires structure to minimize mistakes. The bottom line? It's a very different marketing world that the one in which many industrial marketers first practiced their craft. Want help adapting? Check out Consilium's Step-by-Step Guide to Internet Marketing and register to be notified when our comprehensive new guide to Industrial Marketing is released.